Are you creative? Do you love to sew, paint, draw, or scrapbook? 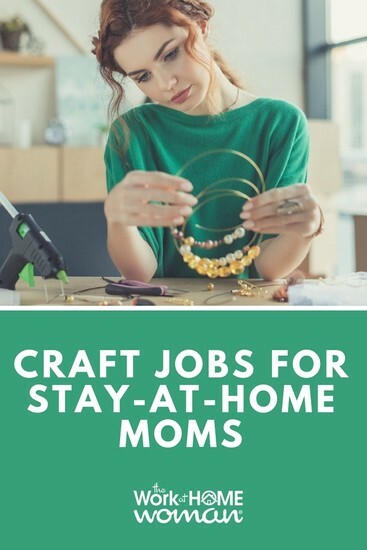 If you’re artsy and crafty check out these great craft jobs for stay-at-home moms. Crafters, if you’re full of ideas or ingenious solutions to crafting problems—you’ve already found your perfect blog focus! “Craft blogging” is a huge niche that encompasses a myriad of focuses. Paper crafts, photography, wood painting, printmaking, and home decorating all fall under the category of crafting. Perhaps you enjoy creating crafts with your kids, cooking or baking, or even holiday-specific craftwork. Maybe you’re interested in blogging about knitting, sewing, or quilt-based crafting. Many stay-at-home moms who want to start a blog struggle with what to write about, but for crafters, simply doing what you love provides you with an endless well of ideas and topics surrounding your craft. If you’re an expert crafter, setting up and starting a blog is a natural extension to share your talents. Get started by reading other craft blogs in your niche to discover best practices. Try photographing your process. Share detailed, step-by-step instructions to help your audience connect with your projects and content. Use Pinterest and other social media sites to drive traffic to your blog. With work, it’s possible to turn your crafting blog into a full-time source of income. In fact, that's what Laurie from Tip Junkie has done — you can check out her blog here. If you love to fuel the creative spark in others, becoming a craft instructor is a great work-at-home opportunity. With the plethora of teaching platforms available online, you could record your own instructional videos, teach a class for a specific organization, or create tutorials for other instructors. Teaching classes online is a wonderful way to supplement your income. Instructors earn thousands of dollars per year by simply recording and posting classes on specific, in-demand topics. With the trend toward the DIY mindset, crafts, and artistic endeavors are a great area to explore. There are plenty of places to search for teaching opportunities. Zeqr and Skillshare offer classes in areas of artistic focus such as photography, graphic design and more. If you’re ready to share your talents with the world, teaching is a great option. Best of all, many opportunities allow you to pre-record lessons and interact with students on your own time. For a huge list of sites that allow you to share your crafting expertise, check out this post. Do you prefer selling a tangible product? Then consider joining a direct sales craft opportunity. These opportunities are great if you have a wide social network, you enjoy meeting new people, and selling. Chalky & Company offers a direct sales opportunity providing supplies for painting parties. During painting get-togethers, customers create beautiful decorative items for their home, learn techniques such as crackling, and even work on projects with kids. Customers order online, and consultants get their own website for free for the first three months ($10/month after). You can purchase a starter kit for $99 and then maintain an active status with $150 in orders every three months. Consultants earn 30 percent commission. Another creative direct sales company is Chalk Couture. Chalk Couture offers a similar product and business model. With Chalk Couture, the sign-up fee is also $99. You’ll be charged $25.99 per month for your website, but have the opportunity to earn up to 50 percent commission on certain products. If you enjoy painting and creating décor for your home, these direct sales craft opportunities might be perfect for you. Did you know there are direct sales companies that focus solely on scrapbooking? If you love the social aspect of craft get-togethers and creating paper projects with a group, this may be the perfect work-at-home business opportunity for you. One popular scrapbooking company is Close to My Heart, which offers cute scrapbooking kits as well as tutorials. Consultants earn 22 percent commission on sales, plus freebies and extras. They also receive their own website. Stampin’ Up! has been in business for 30 years, creating popular card-making, stamping and scrapbooking products. As a Demonstrator, you’ll share how-to tutorials with others, earn 20-25 percent commission on sales and have fun creating your own products as well. The starter kit is $125 of product for $99. As an Advisor for Creative Memories, you’ll show others how to preserve and save their memories through scrapbooking. Advisors can join up for $49/year and get a free bag. Commission is based on your sales volume and falls between 10-40 percent. Top sellers also earn account credits towards the purchase of their own paper products. Heritage Makers is part of the Youngevity brands, which include supplements, essential oils, and other popular products. Sales consultants for Heritage Makers help scrapbookers create digital designs for printable products crafted using their photos. Customers can choose from an array of products on which to print their creations—from photobooks to mugs to shirts. Commissions and returns are based on a point system for product sales, so the return varies. There is a mom at my daughter's school who owns an embroidery/personalization business. She monograms and logos t-shirts, hats, bags, lunch boxes, Yeti tumblers, and other items. If you’re interested in starting your own monogramming business, machine rental is a good way to begin. Build up your customer base by completing small jobs at first, then grow from there to see success. Eventually, you’ll be able to invest in your own machine and take on even more orders. Many businesses and sports teams love the idea of working with a local vendor, especially when they can get a feel for the product, see samples firsthand and approve the design in person. If you love sewing, starting an embroidery business may be a great way to cultivate your skills. Etsy is the go-to spot that many of us think of when we envision work-at-home crafting opportunities. After all, Etsy offers a platform to sell any creation you imagine. Selling your creations on Etsy isn’t without challenges. The competition on Etsy is fierce and for certain crafts, particularly trending items, quality and even photography will help a product stand apart. 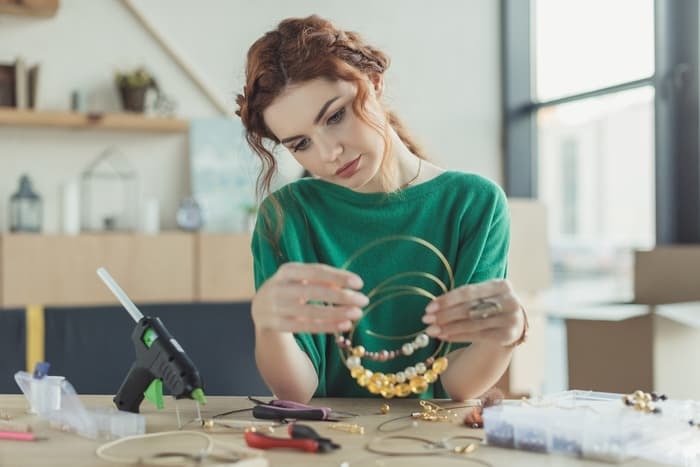 Because there are so many handcrafted items on Etsy, potential buyers may not find your business with a simple search. This is especially true if you’re selling something either very commonplace or very unique (that perhaps people might not search for). This is why it’s important to build up your audience by creating a blog and/or social media presence to funnel traffic to your Etsy store. On Etsy, you set your own price and promote your own product. Etsy charges a small listing fee of $.20 per item and a 3.5 percent transaction fee for everything sold. Pricing your creation at a competitive rate and offering reliable, fast shipping and customer service will ensure you receive repeat customers and build your ratings. Those with great ideas and pattern planning skills can earn a money by making their own patterns to sell on sites like Craftsy. Many home crafters love to DIY, so they search for tutorials and patterns to help them create beautiful projects. Listing your patterns on Craftsy is free and aside from the PayPal fee, designers keep their revenue from selling their patterns. (Craftsy earns money from advertising and tutorials.) To post a pattern on Craftsy, you simply need a PDF file of the pattern and a photo of the finished project. After writing a description, your product is ready for purchase. Craftsy is an easy way to earn passive income. Once your pattern has been created, you can sell it over and over—no follow-up needed. Creating and selling patterns on Craftsy is a great way to earn money online. Popular craft bloggers like Jamie Dorobek and Holly Homer have created and published their own craft books. Many bloggers find that repackaging their stand-out posts with additional content, then adding a well-formatted design is all they need to do to create a best-selling craft book. Self-publishing an eBook is an easy way to start, especially as you’re just feeling out the market for your book. Offering downloadable or e-reader-friendly formats will ensure your ideas get in the hands of crafters and creators right away. Choose an area of focus (knitting, crochet, felting, quilling) or compile your tutorials based on a common theme (holiday crafts, crafts for kids, easy crafts for beginners). Get to know your audience and create a craft book your niche will love. If you’re great with a pair of knitting needles, craft stores, pattern makers and yarn shops will often pay knitters to test patterns and create samples. Test knitters look for mistakes in patterns and alert the pattern maker to any problems or areas where clarification is needed. Whenever you see a sample sweater or scarf hanging in the store, chances are it was created by a test knitter. While test and sample knitting isn’t high paying (most projects offer compensation between $50 and $200 per project, which comes out to less than minimum wage), it’s fun and it’s exciting to see your projects hanging or photographed. By crafting samples, you’ll also build your knitting speed and skill level. Plus, test knitting is a nice stay-at-home income option with flexible hours. To learn more about becoming a test knitter, read this great tutorial from The Penny Hoarder. YouTube is always growing and approximately 5 billion videos are watched on YouTube per day! The good news is starting a YouTube crafting channel doesn’t require much in terms of initial investment. Some YouTubers earn a solid living, but there’s a lot of promotion and work involved. Success and popularity rarely happen overnight. YouTubers who find the most success are great at cross-promoting their channel on social media and through blogging. Earning money on your channel is dependent on its popularity and the advertising revenue you can generate. Creating solid, helpful content that’s clear and easy-to-follow will boost your views and help you connect with your audience. Alert: Watch Out for Craft Assembly Scams! Sadly, there is one area where ambitious crafters are often taken advantage of. If you find a “job offer” to perform at-home piecework or craft assembly—it’s often a scam. These scams usually work by setting up nearly impossible expectations for productivity. For example, you may be paid by the number of items you can put together in an hour, only to find it takes much longer to assemble them then was promised in the ad. Other versions of this scam offer kits for an up-front purchase. Recipients find the kits are then missing pieces, difficult to assemble, or don’t include proper instructions. The resale value on the finished product is low and crafters end up losing out on their investment and wasted time. Fortunately, there are plenty of legit, great opportunities for crafters and creatives to put their skills to good use. If you have artistic and creative talent, use it to earn money from home. Selling your handiwork is a rewarding experience and a wonderful way to express your creativity! Melanie from Simple Made Pretty sells her handmade cards on Etsy. Hi, I would like more info about working from home. Have tried so many but it was unsuccessful, hoping this will work. I have removed your email address so that you don’t end up receiving a bunch of spam email. You can click on the blue hyperlinks within the article for additional information, or if you have a specific question, drop it here, and I’ll do my best to help you. Good luck on your work-at-home journey!